At Epworth Swimming Pool we believe in giving you great value for money. 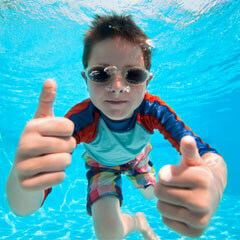 Our prices are some of the best around, allowing you and your children to swim locally without it costing the earth. We have a range of swimming passes for regular swimmers, allowing you to save money on your weekly swimming activities. If you are wanting to learn how to swim, we have special swimming lessons just for you. Whether you are completely new to swimming, or just want to brush up on your techniques, our experienced swimming instructors will take you step by step and have you swimming by yourself in no time. Our Aqua classes are an amazing and fun way to use swimming to get fit or tone up. Aqua Fit is an exercise class run to music – with a fully qualified Instructor. This class is aimed at both males and females, of all ages. At Epworth Swimming Pool we have a great selection of swimming related items for you. From swimming caps, goggles and ear plugs, to arm bands, certificates and badges. You can purchase all of the items from the main Reception area. Pool Parties are a fabulous way to enjoy birthdays and special events. Have the most amazing ‘Pool Party’ with our inflatable ‘Yellow Submarine’, balls and floats. Ask at reception for a Pool Party Booking Form.